Hey everyone! Wow! I can’t stop saying WOW! What a very exciting last 24 hours! You all are our favorite people ever! 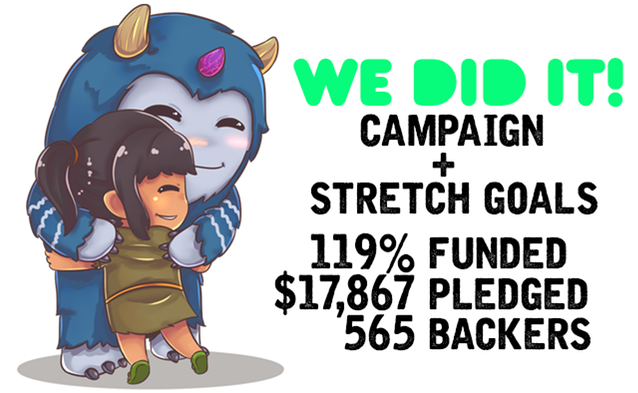 Not only did we get Unraveled completely funded, you smashed those Stretch Goals! That get’s us double the music by Dale North and a 2nd theme song by Hiroki Kikuta!! You stood behind an underdog of a project! You shared Unraveled through Social media, your pets and even your grandma! Thank you so much! Completely unintentionally, Unraveled’s Kickstarter campaign ends one year from the day we started this tiny little project! We didn’t even realize it until 3 days ago! Unraveled started with a setting, Shipbreaking. From there it grew the characters you see up above. The girl’s journey to find what she misses most has entangled all of us. It’s been an amazing year full of ups and downs to get us to this point. We’ll be sharing some early pictures and artwork with you on our next update. I just wanted to share with you how amazingly everything came together! It’s all because of you! We’re truly in amazement and forever grateful for putting your love and trust into two guys wanting to bring awareness to a tough subject. Understanding is the first step to bettering other people’s lives and we’re taking that step together! Just want to give a HUGE shout-out and Thank You to Jayson Napolitano (he’s the behind the scenes guy), Hiroki Kikuta, Dale North, all of the other amazing Kickstarter projects that have given us support through shout-outs and well wishes (GO BACK THEM), to our amazing loved ones, families, friends and of course our amazing Backers (YOU)! ← Day 28: We are funded!